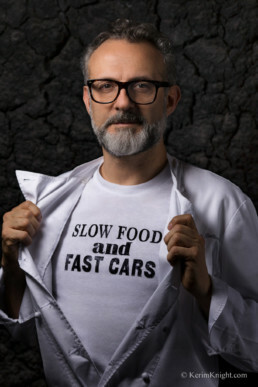 A quick trip to Modena, Italy with a mission: Go with Eyes Magazine for an exclusive interview and a quick photoshoot one of the world’s most exclusive (and busiest) chefs; Massimo Bottura, in 1 hour. Francesca Mastrovito, Massimo’s PR/Marketing Manager. Sponsored by Maserati, we jumped on a train from Geneva to Zurich to be picked up by Maserati Switzerland, where we are given the keys to the new Sporty Jeep, the Levante. The shoot, has to be pulled off faster than what the Maserati can get us to Modena (a 3 hour drive). 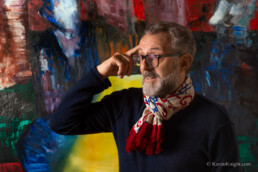 The objective of Eyes Magazine is to interview and portray Massimo Bottura as himself, in and around Modena. Not in the cliché type shots of a chef, in the kitchen or his hat and a few knives. However, to portray his character; his beliefs, his views and remarkably, his playfulness that came out too. 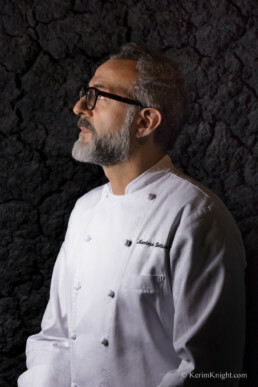 Massimo talks about his philosophy of food and culture. A side project of an open kitchen, free and open to the poor (a project recently picked up by Rockefeller Foundation) how he sees food and cooking is going. That everyone has a form of social responsibility to add to the environment, and they use what tools they have around them. 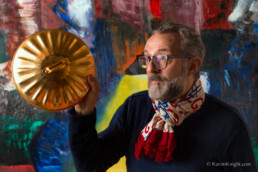 We needed 5-6 pictures of Massimo for the article and the cover. All to be done within our limited time and we left with over 10 (in fact 12 as two other sets that weren’t used, so we got double the goal). The pictures are shot using the Sigma 50mm f1.4 Art, Canon’s 24mm f1.2 but mostly using Canon’s 85mm f1.8 lens. This lens is the real surprise here as I mainly use my 135mm f1.2 for portraits these days, but this time I was forced to pull this out of the bag. This lens retails at around $350 on Amazon.com and as far as lenses go, this is a fairly cheap lens. Though when I look at the images on the computer, I find myself checking what I shot these images with, as they are nearly as clean and crisp as the 135mm, which seems to constantly surprise me. Proof that you don’t always need the expensive gear to get what you need. I also used 1x Profoto B1, the smallest softbox Profoto makes (OCF 1.3×1.3) or using the B1’s bare bulb and a reflector. I need to travel light, be agile and quick and you can’t do that with a lot of gear. Specially as I only shoot with prime lenses which adds to weight and time to change lenses over. As my Commercial Photography career progresses, I’ve found that the less you take, the less time you spend trying to figure out what to use. I also believe, gear is not what makes you a good photographer. – Lots of photographers constantly ask about gear and/or what they have. When I shoot, I look for locations knowing what lens I can use within that space. – I am not trying to organise a shoot or location according to what gear I want to use; maybe that’s a big difference? Also, photographing Massimo or someone who’s pushed for time, whilst they are being interviewed is actually quite a hard process to manage. That is, to get half decent pictures, manage the subject and not break up/disrupt the interview in an erratic way that it ruins the vibe. Everything needs to be calm, smooth and harmonious and also a bit of fun. Also, you have to capture the moments where people aren’t talking or have their mouths open in mid sentence. The full magazine article and cover, can be found in my Press Page here: And below I’ve added a few of the behind the scene videos. 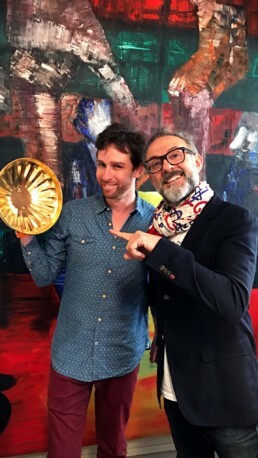 And if you’re not sure who that random person is with Massimo? Well, that’s me. – A quick duo shot of both of us at the end of the shoot and interview. Thank you, for the BTS pictures Eyes Magazine and “thank you:|” Massimo for a great 1 hour.